I received an email about an in introductory video I made for medical students about intention-to-treat (ITT) analysis. The author of the email also made a comment about the video on YouTube. The points he makes are valid and he expands on them in this manuscript. I will defend, if you will, the concept of ITT analysis. First, ITT analysis refers to analyzing all patients based on the arm of a study they are randomized to no matter what happens to them…”Once randomized, always analyzed”. Even if they don’t take the intervention or become non-compliant their outcomes count against the group to which they were randomized. It is considered the primary analysis for superiority studies (where we want to prove an intervention is better than something else). Important background disclaimer: ITT analysis is just one part of the methodology of a randomized controlled trial. (The other parts being concealed allocation, randomization, blinding, equal cointerventions, etc.) There is a tendency of critics of ITT analysis to think of it in isolation and I think that is a mistake. It is just part of an overall plan for conducting a study. Randomization is considered the gold standard methodology for allocation in therapy studies. It is done for a couple of main reasons: 1) to equalize both known and unknown prognostic or confounding factors and 2) to prevent selection bias or cherry picking of patients to one arm of the study or another based on prognosis. In general, ITT analysis helps preserve the effect of randomization. If you start pulling out people differentially from each arm of a study the remaining people (to be analyzed) are likely not balanced prognostically. Yes, you can adjust for disparities between groups but only those that are measured. You can not adjust for unmeasured confounders. Randomization balances even unmeasured counfounders (assuming sample size is large enough). So its important to preserve randomization. Dr. Feinman points out in his comment that “In the experiment, people sensibly want to know what is the effect of surgery compared to aspirin. Instead, ITT answers instead what is the effect of TELLING PEOPLE to have surgery vs. taking aspirin. Is that really what you want to know?” This is true but this is what we do in practice. I recommend a strategy to a patient and they will either follow it or they wont. So maybe it’s not the ITT analysis that is the problem but the question of the study. Another piece to this is that a per-protocol analysis can (and probably should) be done after the ITT analysis to see the effect in those who actually got the therapy. The results of both analyses should be reported so the reader can better understand the results. Data on dropout/noncompliant patient demographics/comorbidities/etc needs to also be reported so we can better understand potential reasons for drop outs or noncomplaince. I mention in the video that ITT analysis is more conservative in that it will less likely lead you to falsely reject the null hypothesis and falsely conclude that the intervention is effective. This is because those in the intervention group that dont get the intervention are actually like the control group; leading to more similar event rates and more difficulty in finding a significant difference. So using ITT analysis somewhat depends on the risk to the patient of falsely saying the intervention is effective (when it isnt) or falsely saying it isnt effective (when it is). Conversely, per protocol analysis is less conservative in superiority studies. I’m not sure what Ive written here will change anyones mind. I think a compromise is to use both ITT analysis and per protocol analysis and report both results. Hopefully, they are similar or at least qualitatively similar. What do you say about this controversy? I am going to write a 2 part series on what we should wear as physicians. I was inspired to do this when my resident said he has received an email declaring all male physicians must wear ties. I mostly have abandoned tie wearing as they are hot, uncomfortable and I just can’t find matching ties to many of the shirts I want to wear and don’t want to commit a fashion faux pas. I also perceived them to be an infection risk (I will address this in part 2 of this series). When I don’t wear a tie I wear my white coat. When I wear a tie I often forgo the white coat. What do patients think about this? I felt it important to try to review a smattering of the literature on the topic. I admit I didn’t do a full literature review because the importance of this is just not worth the time. I did randomly select from the studies I did find so as not to only support my biased opinion that patients don’t really care what we wear. There is a fair amount of literature on this topic in both the medical and dental world. Many of the studies included pictures like the following for patients to critique and give their opinion of the physicians depicted. They were often asked about the professionalism of the attire and their desirability of certain aspects of dress. 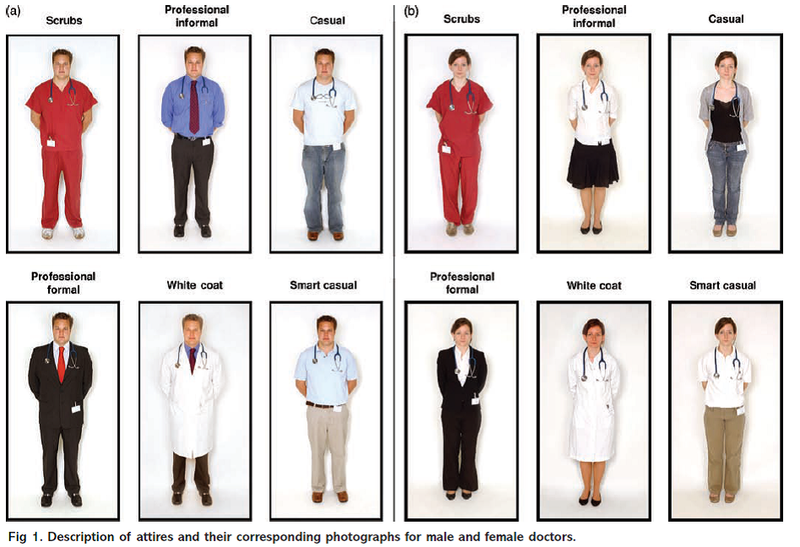 I didn’t find a dress option I really had hoped to find information on: white coat but no tie. What do patient’s think about how we dress? Below are some selected figures from studies showing these results. 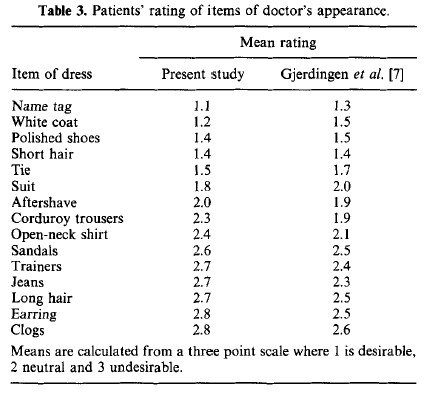 This first table shows that wearing a tie was fairly desirable but not as desirable as a name tag and white coat. The figure below was from a study of anesthesiologist. It included 110 patients. You can see that wearing a tie was felt to be important by about 25-30% of them. Wearing a name tag and white coat was more important. 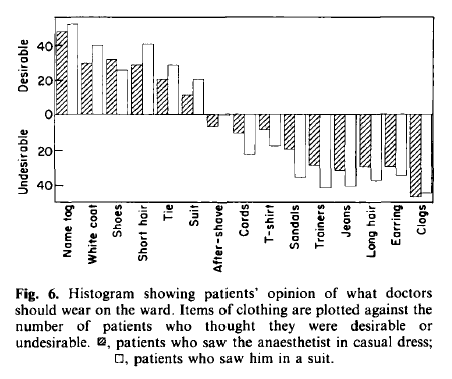 The figure below suggests that wearing a ties led to greater patient comfort in dealing with the doctor. 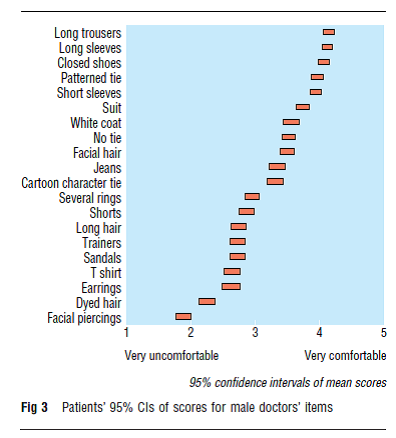 Interestingly, not wearing a tie has the same ranking as wearing a white coat in patient’s comfort of dealing with a doctor dressed in such a way. Finally, the table below shows patients in this study mostly disagreed that ties were important and didn’t even feel white coats were all that important. They felt is was most important for doctors to act professionally. So, there you have it. White coats and name tags seem to be the most important. It helps patients identify us as doctors and we are perceived to be more professional in the white coat. Ties have mixed results. I am still undecided as to how I feel about this. I used to love wearing ties…now not so much. I think I will make my decision after I review the infection risk data. Stay tuned for that installment which will be coming soon. I am not impressed by the recent declaration in BMJ just because it is about the bad studies and the need of new EBM. What new? The authors of the declaration published calls for new EBM almost annually. And most the time the calls are to go beyond evidence, and to do good, not bad. Yes, too many research are poorly designed and executed. Is it new finding? Was ever EBM quiet about the bad evidence? “today’s world …so financially driven” – was it ever not like that? Can one name the Golden Age? If not kill your self, one need to live in the real world and try to make it better. EBM is specifically about it: critical appraisal and education (in wide sense). It is about use of the best available evidence for the good of the patients. Best available, sic. To influence research, to improve research, to clean the publication practice is a good thing, but it is beyond EBM in pure sense. From the link, ” Too many research studies are poorly designed or executed. Too much of the resulting research evidence is withheld or disseminated piecemeal”. In short, medical research is not implemented correctly for a number of reasons. So my question is should we scrap medical research? OR RCT’s which are supposed to be the gold standard for trials should be dropped from research? For me the most logical answer is better implementation. So the debate should how we can do this in today’s world which is so financially driven. In other words, the debate/discussions should not be about research or RCT’s are flawed and hence should be replaced. Also, please don’t blame EBM for shoddy research practices. EBM has no control on what researchers like to do or don’t like to do. EBM can only make recommendations on how to do better research and interpret research. My miniepiphany why reading this string was that academic medicine is partly to blame for some of the problems in the evidence base. In academics you have to garner grants to pay for yourself (or at least part of your salary) and you have to publish to get promoted. So we have a system that rewards quantity over quality. Lots of research is done because we have to do it to get promoted. But how much of it is worthwhile research? Not much. Many academics aren’t trained in proper research technique so they perform lower quality studies. So one fix to “EBM” could be to restructure how we finance academics. We need to quit focusing on grants (especially considering governmental funding of these goes down every year) for compensation. Teaching (and yes medical schools need to actually pay adequately for the teaching we do) and clinical activities should be the primary funders of academics. Then research could be done on important things and by properly trained researchers. What can we do to reduce the amount of research that goes unpublished? A “simple” solution is for the drug/device approval process to require all studies related to that product and/or conducted/funded by the requesting company be registered and published. This would miss studies done after drug/device approval or done by independent parties but a large number of nonpublished studies are conducted or funded by the companies that market the drug/device. This would also miss all the other studies not directly related to drug/devices (e.g. epidemiological studies). Another significant challenge is where to publish this information. The web makes the most sense as this is the cheapest route of publication. Maybe the FDA (or some international commission) could have a page(s) on each drug that includes full text access to all studies done on that drug/device. Would these need peer and editorial review? Yes, but a daunting task as we already struggle to find willing and competent peer reviewers. FDA budgets shrink repeatedly and this would be a significant financial burden. What is better a large RCT or a SR based on a “biased subsample”? Is a large RCT more desirable than a systematic review (SR) based on a biased subsample of studies? This has been a conundrum for some time. You can argue both sides of this. The reason he says biased subsample is that we know more positive studies get published than negative, larger effects get published more than small effects, etc. Is the answer to this question “it depends”? It depends on your goals: a more precise estimate of the biased effect (favors SR), more generalizability (favors SR), a potentially more methodologically sound result (favors RCT). What is interesting to consider is that the same study repeated over and over will result in a distribution of results (this is why it shouldn’t surprise us that when we do seemingly the same study we don’t get the exact same result). Should we repeat studies? When should we stop repeating the studies (i.e. when have we adequately defined the distribution of results)? I don’t think we can really answer this question as both of these study types have limitations but if I had to pick one I would rather have a large RCT that is well done than a SR based on a limited subset of the data especially considering we don’t know what is missing and the effect seen in those missing studies.